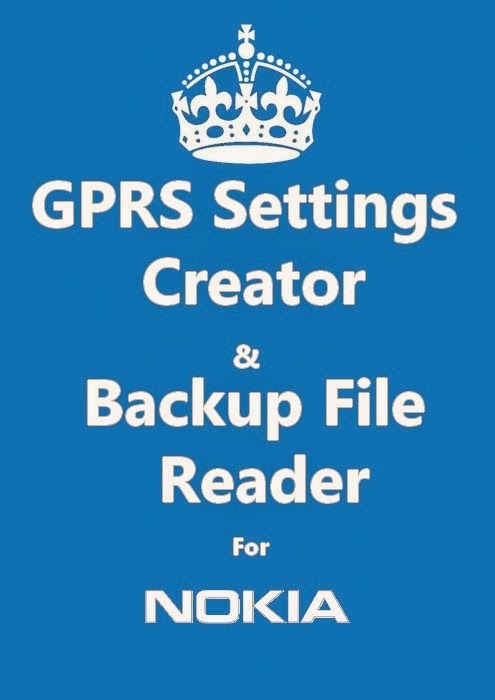 If you are using any Nokia mobile, you must have 'PROV file creator' that will create a GPRS settings file for internet connection and a 'Nokia Backup File Reader' that will read a proprietary Nokia backup file. These are a small tool that you will need at-least once in lifetime of your Nokia mobile. When you want to use wap or internet over your mobile through GPRS, Edge or 3G, you need to have connection settings which you have to request to your service provider. Most probably you will get those settings in a few minutes but sometimes you may not be so lucky. Also some new series of Nokia mobile do not support custom configuration settings. Nokia mobile like Nokia C2-03, Nokia Asha 200 do not support user created GPRS settings. That is problematic if you want to enter customized gprs settings on your mobile. In both cases the a small tool called "Java proxy generator" will help you to do that. "Java Proxy Generator" help you to easily generate .prov file which is a standard Nokia gprs settings file. You have to enter GPRS setting values IP Address, port, homepage, access point name, user name and password for your service provider manually. Once you enter these settings you just hit "Generate PROV" button and you will get the GPRS settings file. You have to send it to your Nokia mobile via Bluetooth. You can either send it from your laptop or computer Bluetooth to your mobile or you can transfer this file to other mobile and then send it via Bluetooth to your mobile. Nokia mobile will easily detect the file and prompt you to install the gprs settings received. That's very easy. But if you don't want to download any software tool, there is also online service which does the same thing online. Visit "Access Point Generator" and enter the GPRS settings of the desired service provider or whatever you want and you can save the .prov file to your hard disk. All Nokia mobile has built in functionality to create backup of all the data saved in mobile memory like messages, phone number, address book, personal settings, calendar, notes and gallery files. You can save all this data in a proprietary Nokia format like .nbf, or .noki. .
You can transfer this backup file to your computer as extra backup. The only problem with this file is you can only read this file with the help of Nokia mobile and you can't read this file on your computer or not even on any other mobile. If you change your mobile manufacturer, you are out of help. This data backup file will not come to any use. This is a situation where you really need a "NBU Explorer". NBU Explorer does exactly the same it is intended to do. You can easily read all Nokia backup files on your windows computer and then export all that data, messages, phone book, calendar, gallery files, settings and other data to your computer which can be then used on any other mobile. The file structure of the backup file differs from mobile model and you have to find out the message, address book and other relative folders you want. The phone numbers or a contact information is stored in .vcf files which is a single file for one person and you will find that there are many such files. The more contacts you have in your phone contact list, more will be those vcf files. You can easily convert or merge all the .vcf files into one .vcf file making it easier to manage, transfer and save. My Nokia Asha 200 doesn't recognize the file type .prov when transferred via Bluetooth. Any ideas how to solve this one? 1. Try using the web application. Did you tried this with other Nokia Mobile. Most of the nokia mobiles do recognize it and your Nokia Asha should also. When sent to my mobile, where is the file saved under? I can't find it in my phone? you cant find that file in memory. It is a system file stored hidden in the system memory. You just check that it is working and you can connect to the internet. Where and how can i create a new GPRS settings manually? If you have latest firmware, Nokia S40 all mobiles now have function to create custome 'Configuration settings' built in. No need to use the above software. You can easily create that.